HOLD on Bits and Pieces post covering last week (July 23-29th)... you will just have to wait. We went to Regina over the weekend to see Cirque du Soliel's Quidam. AH-MAZE-ZING! My watermelons are producing fruit! Pictures coming soon! (Okay, that sounds bad, but I swear I'm not being perverted!!!) My watermelon plants, that just a month ago, I thought were not going to make it this summer, actually sprouted flowers and have teeny-tiny watermelons on them! I am so SO SO surprised. Things are very busy at work this week... I anticipate being wiped right out when I get home in the evening. Will likely be very quiet around here until next Thursday (8 more days! pfff - who's counting?). I want to catch up with the bits and pieces posts, and keep gushing about all the exciting things going on this summer. *Crappiest quality blackberry camera phone... in the dark, no flash, under a streetlight. 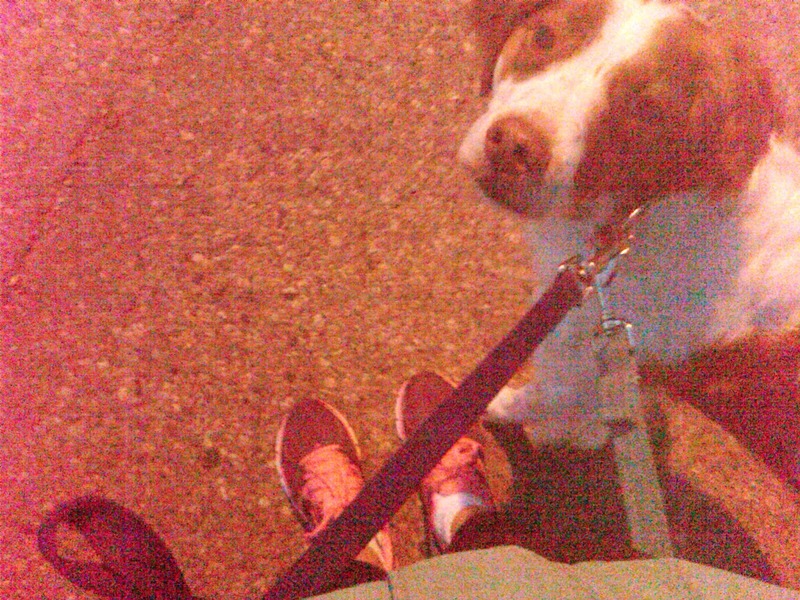 Booger and I out for a lovely daily walk at 4:30AM - am I crazy?